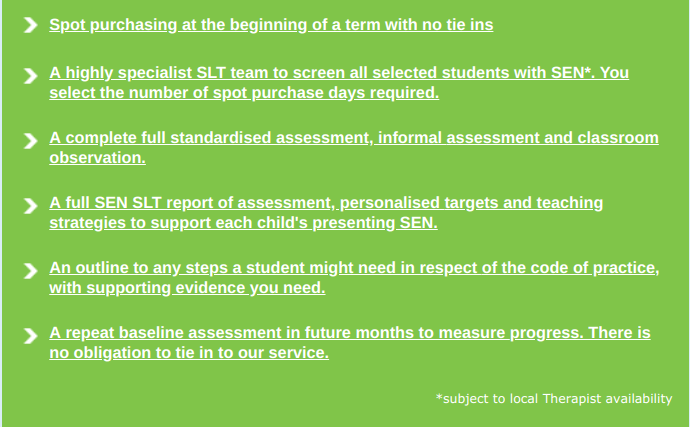 Most settings like assessment to take place at the start of the school year as such we let you spot purchase this service at the beginning of term with no tie ins. Buy units to assess in September and then reassess each term or at the end of the year – you can buy units for one pupil, or more, and for a term, or the full academic year, use them when you need to. Expressive Language or Comprehension of Language assessment – This focuses on the child’s understanding and expressive language, the vocabulary used and sentence structure.